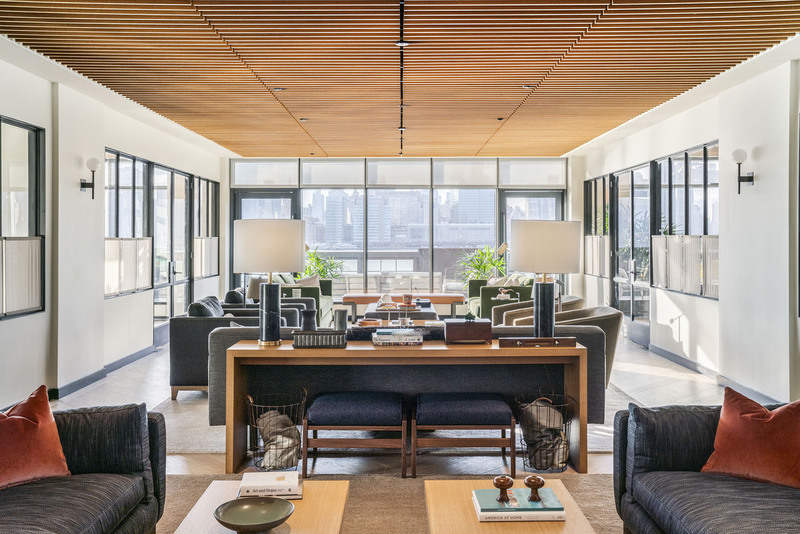 Sweeping Manhattan views frame this full floor of amenity spaces, designed by Gachot Studios with modern comfort and maximum enjoyment in mind. Entertain friends, hang out with neighbors and enjoy this extra living space. 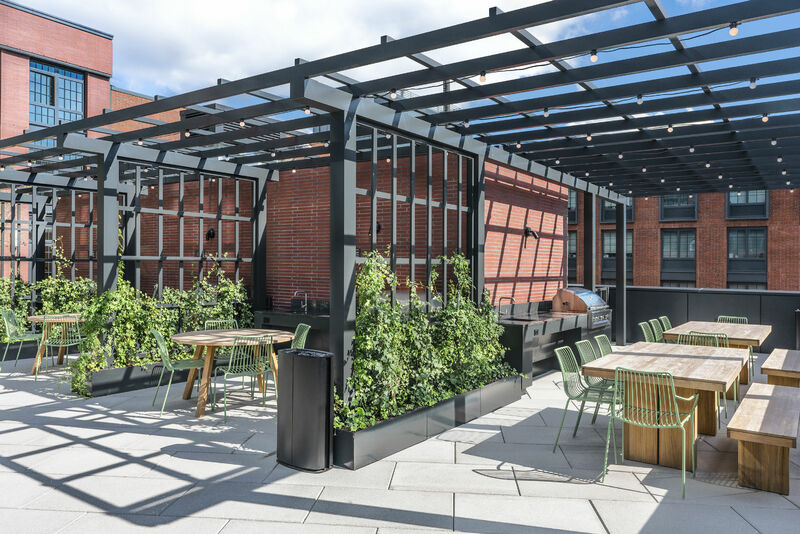 On the expansive outdoor terrace, you can hold a picnic on the lawn or relax on the chaise lounges; the options are endless. 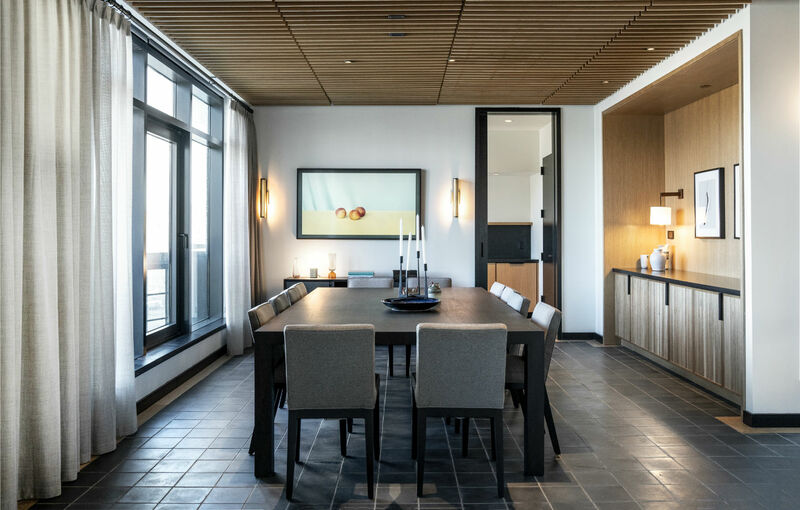 Catering to the tech savvy, the unique media and co-work space features plug and play functionality for the entrepreneur or frequent gamer. The consummate host will enjoy the gaming room, lively bar, and elegant lounge, which includes a reservable event space. 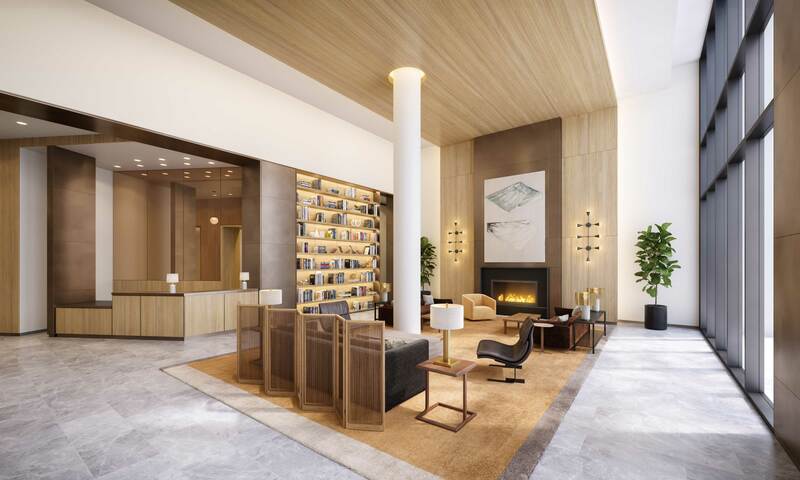 Modern conveniences throughout include Latch keyless entry system, One Blue Slip Concierge, on-site parking with valet service and direct access to the building. Unwind in our yoga studio with a private outdoor terrace, outfitted with Wellbeats virtual fitness training. Take your pup for a pampering day at the residents-only pet grooming center and finish out the day with a stroll on the Promenade. 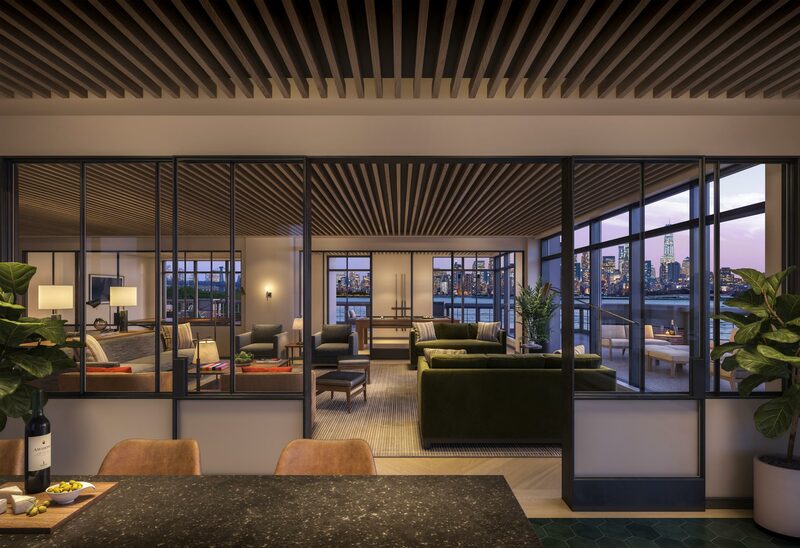 Designed by Gachot Studios to emphasize style and comfort, this luxurious living area — which includes a reservable event space — is yet another place for residents to relax, entertain, and socialize, all with breathtaking views of Manhattan and the East River. Pet Grooming Station: Exclusive resident only doggy care center to help your pet look their best. Latch: This smart access system will ensure you never have to call a locksmith again, with patented technology allowing personal home management and keyless entry from your mobile device. Hello Alfred: A digital concierge that will take care of to-dos like laundry, cleaning, grocery shopping, and more – all with a personalized touch. 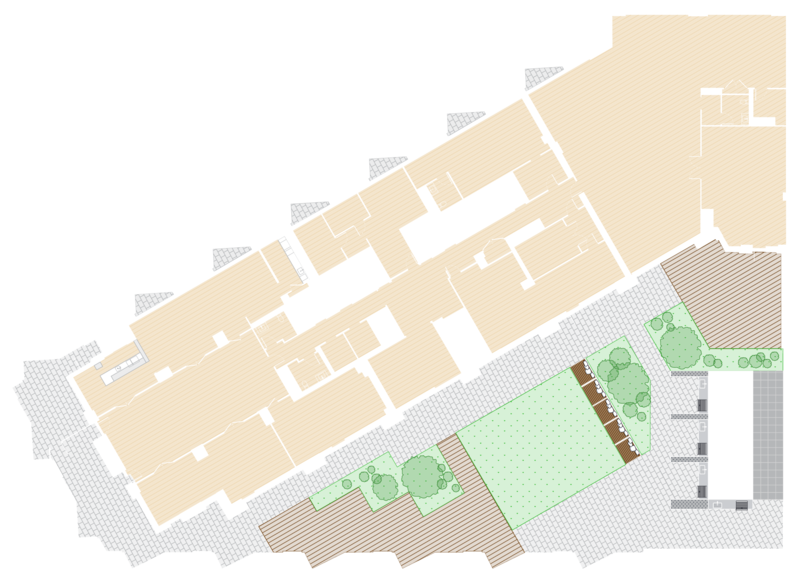 On-Site Parking: Enjoy the ease of the on-site parking, with valet and direct access to the building, a truly intimate drive & drop off experience. Host a multitude of events in this reservable multi-functional space, designed with a seasoned party host in mind. Create a signature drink, mingle, unwind after a long workday; the possibilities around the bar are endless. For the enthusiastic or newly initiated gamer, the fully equipped Game room offers a Pool Table, Ping Pong Table, drink rail and casual seating, with direct access to the terrace. A home away from home just a few floors down, this media room with large TVs and a deep lounge sofa for seating is ideal for movie screenings, rainy day getaways, or socializing with friends. Take advantage of the top of the line entertainment capabilities and terrace access. Playtime just became a breeze. Designed to encourage curiosity and wellness, this expansive area features a large play structure, craft table, and story time area, along with with central stroller parking. Working remotely has never been easier with this plug and play resident only co-working space. 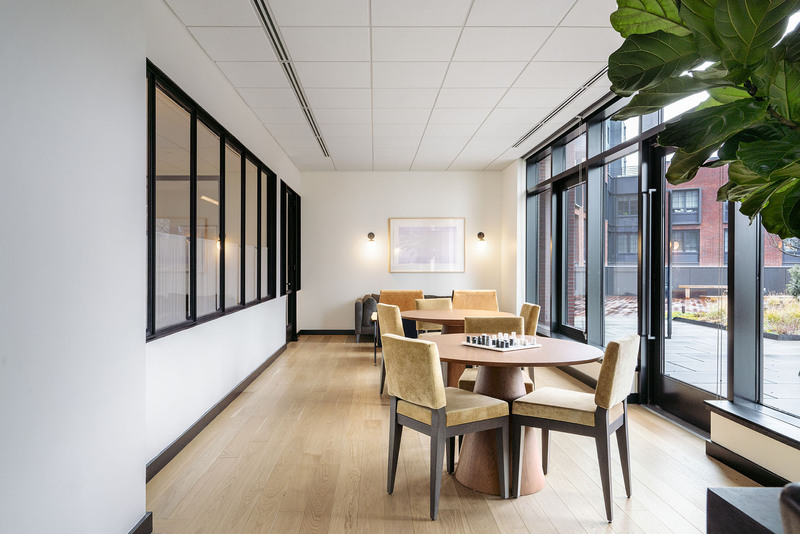 The quiet environment includes an array of communal tables and lounge seating designed for an innovative and collaborative work environment. 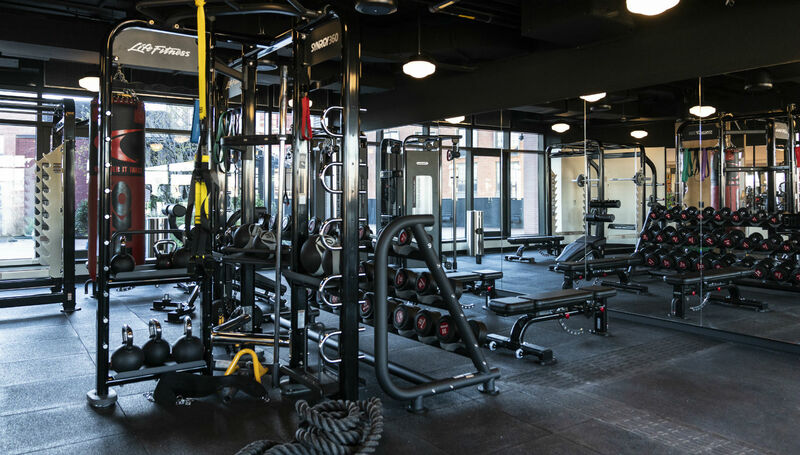 Sweat it out in this exclusive residents-only, fully outfitted fitness center. 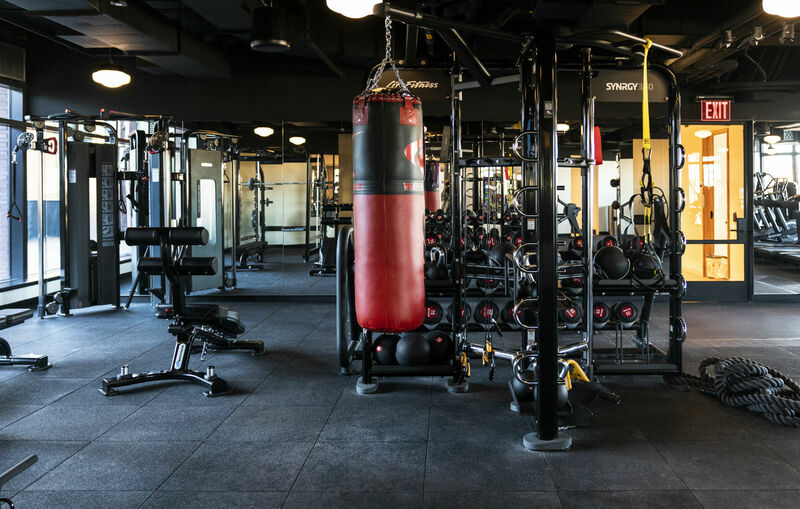 Including a Cardio Zone, Free Weight Zone, and regularly scheduled fitness classes, and of course plenty of space for stretching. Take a moment to breathe in this uniquely airy and spacious studio, which also features a Wellbeats Virtual Fitness system and an outdoor yoga terrace. 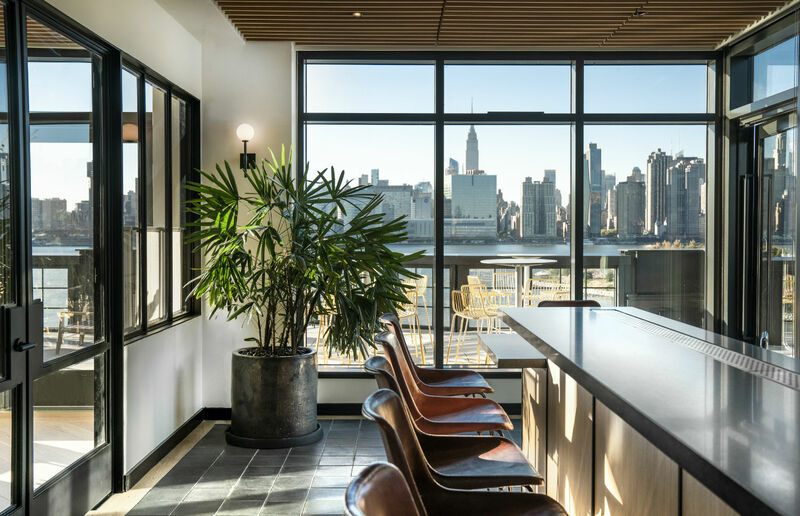 Take in the Manhattan skyline from this peaceful vantage point designed by Future Green, the team behind the Brooklyn Children’s Museum greenery. 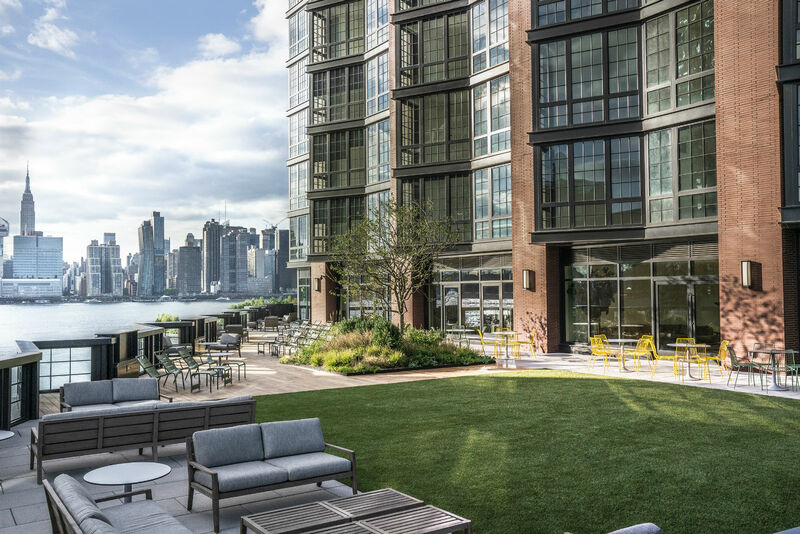 Soak up the sun on a cozy lounge chair, picnic on the grass, host a private gathering in one of the intimate seating areas, or play bocce ball or shuffleboard with friends and neighbors. Become a grillmaster at our well equipped outdoor kitchens with plenty of room to entertain. 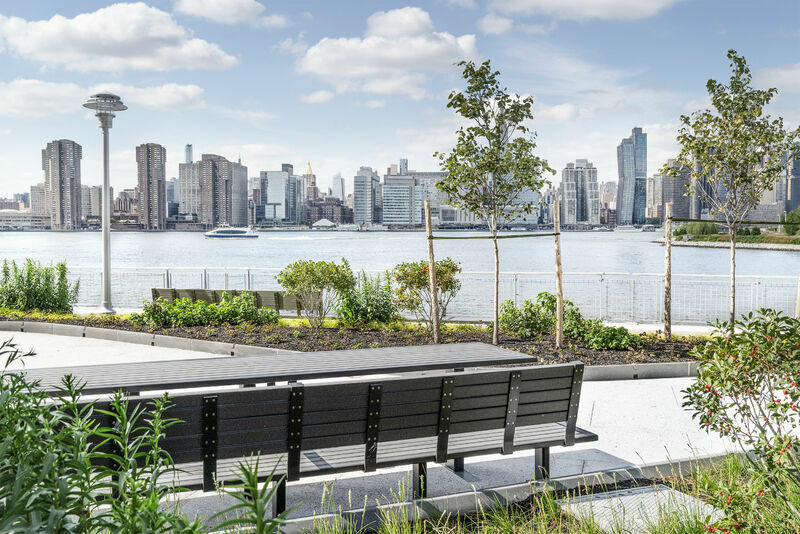 Take in the Manhattan skyline from this peaceful vantage point designed by Future Green, the team behind the Brooklyn Children’s Museum greenery. 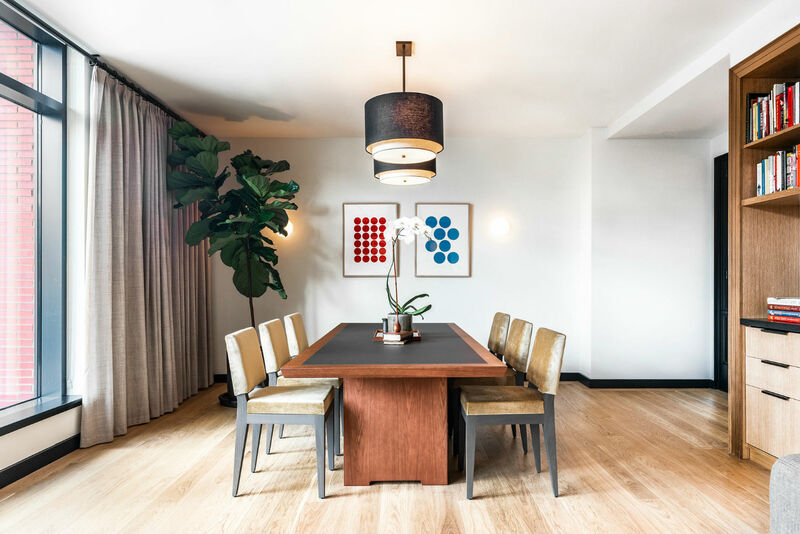 Soak up the sun on a cozy lounge chair, picnic on the grass, host a private gathering in one of the intimate seating areas, or play bocce ball or shuffleboard with friends and neighbors. Become a grillmaster at our well equipped outdoor kitchens with plenty of room to entertain. 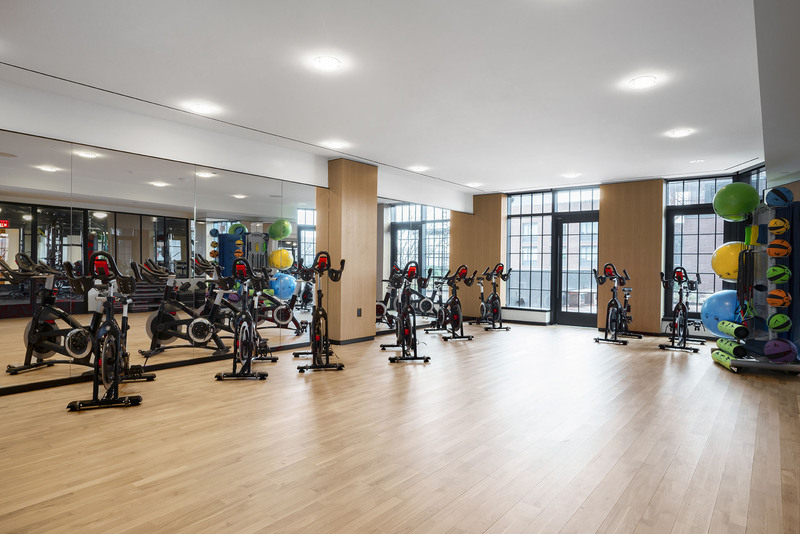 Sweat it out in this exclusive residents-only, fully outfitted fitness center. Including a Cardio Zone, Free Weight Zone, and regularly scheduled fitness classes, and of course plenty of space for stretching. 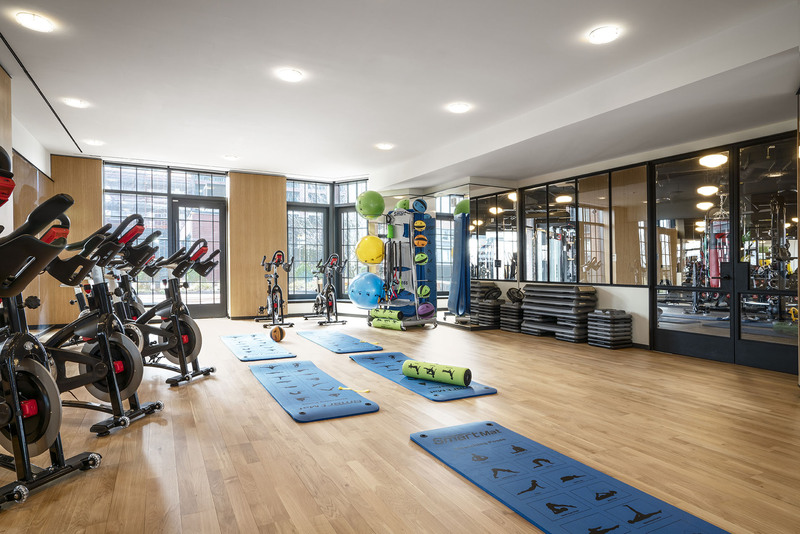 Take a moment to breathe in this uniquely airy and spacious studio, which also features a Wellbeats Virtual Fitness system and an outdoor yoga terrace. A home away from home just a few floors down, this media room with large TVs and a deep lounge sofa for seating is ideal for movie screenings, rainy day getaways, or socializing with friends. Take advantage of the top of the line entertainment capabilities and terrace access. 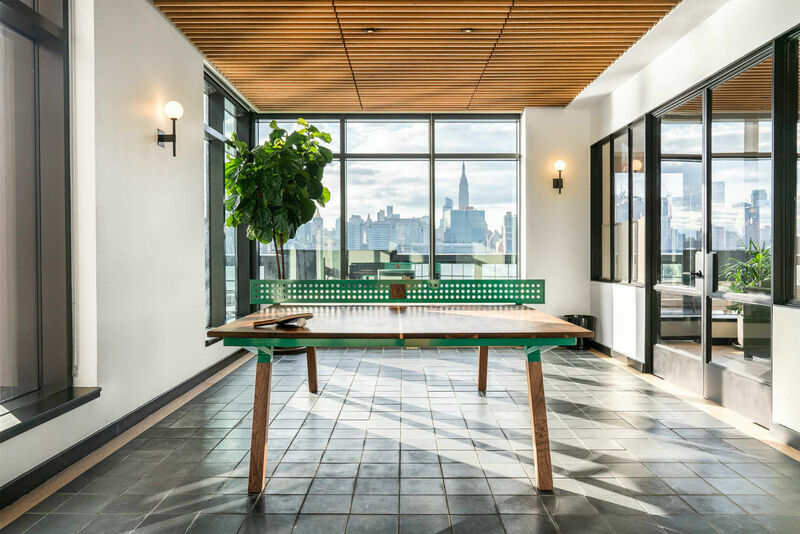 For the enthusiastic or newly initiated gamer, the fully equipped Game area offers a Pool Table, Ping Pong Table, drink rail and casual seating, with direct access to the terrace. Enjoy the ease of the on-site parking, with valet and direct access to the building, a truly intimate drive & drop off experience. This smart access system will ensure you never have to call a locksmith again, with patented technology allowing personal home management and keyless entry from your mobile device. Exclusive resident only doggy care center to help your pet look their best. 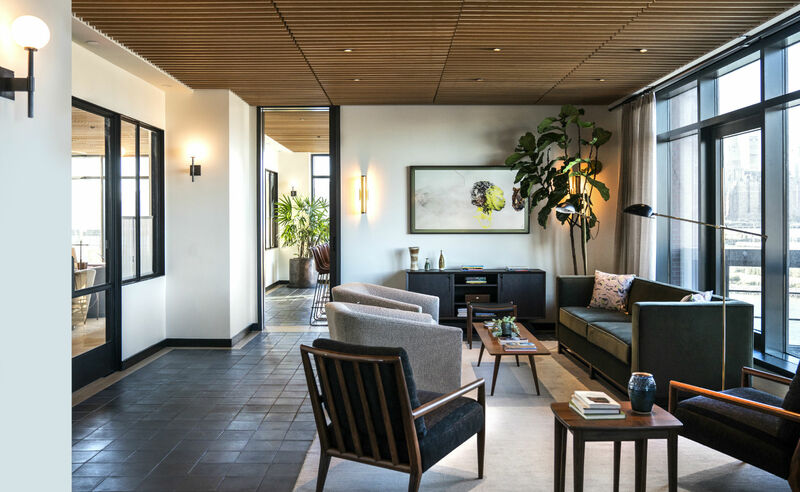 Gachot Studios has designed the Lobby and Amenity Areas as places for residents to retreat and collect themselves while soaking in views of the inspirational skyline. Hello Alfred’s digital concierge service will take care of to-do’s like deliveries, laundry, grocery shopping, and more – all with a personalized touch. Latch’s smart access system ensures you’ll never need a locksmith again, with their patented technology that allows personal home management and keyless entry all from your mobile device. In partnership with ride-sharing service Via, One Blue Slip residents receive an exclusive transport package to and from select transportation hubs. 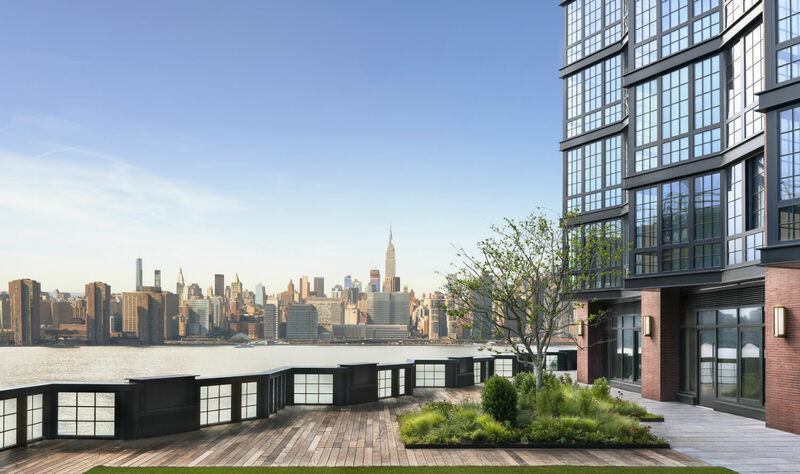 At Greenpoint Landing, James Corner Field Ops, the team behind the High Line in Chelsea, has curated an expansive promenade, providing a valuable addition to the future of the East River waterfront located at the end of a private cobblestone cul-de-sac.